We all do better when we have a support network. As highlighted during the Day One video presentation, when a single organization joins forces with thousands of others to share knowledge, ideas and best practices, it becomes much more powerful than it could be on its own. 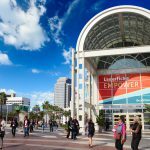 At Empower 2011, it was clear that the Laserfiche community understands the strength inherent in numbers. It was our largest conference ever, attracting 1,400 attendees in the form of VARs, customers, prospects, analysts, reporters and Laserfiche employees. “In 2010, the members of the Laserfiche community showed real ingenuity and creativity in their use of agile ECM. We’re delighted by their achievements and honored they made the effort to attend the conference to share the secrets of their success with their peers,” said Nien-Ling during her keynote speech. Using Laserfiche, Durham County, NC, will reduce Workers’ Comp claims by millions of dollars over the next few years. “Because staff no longer has to transport heavy files to court or move heavy boxes to retrieve closed files, the risk for injuries, particularly back injuries, has been greatly reduced. Laserfiche will potentially mitigate Workers’ Compensation claims by millions in the next few years,” explained Nina Bullock, Administrative Assistant to the County Attorney. In addition to individual organizations’ successes, the community as a whole had a productive year. The number of Laserfiche Luminaries expanded by 25%, the number of customer-led user groups multiplied to 30, and more than 15,500 people attended 385 Webinars over the course of the year. Nearly 50% of the top digital cities and counties in America are Laserfiche users, and hundreds of people have already certified their content management expertise through the Laserfiche Certified Professional Program. Laserfiche itself had a busy year, supporting the launch of Laserfiche Strategic Services Canada, expanding its offices in Hong Kong and Shanghai, releasing Laserfiche 8.2 and a new integration with Salesforce.com, and becoming the first (and, so far, only) ECM provider to achieve DoD 5015.2 certification for its integration with SharePoint 2010. For Laserfiche, 2011 will be another year of growth. We’ll soon be opening a new domestic office, as well as sharpening our focus on Latin America and continuing to empower LFI’s success in the Pacific Rim. Ensuring that Laserfiche provides a seamless mobile experience with innovations like the Laserfiche iPhone app. Expanding the number of pre-built activities included with Workflow. Making Laserfiche 8.3 compliant with Australia’s VERS certification requirements.